My interest in miniatures began years ago while attending New York Institute of Technology where I studied Architecture. I took interest in designing miniature structures. My sister opened a miniature shop 22 years ago called Miniature Designs, in Lawrenceville, Georgia. Some years later her business grew and my sister and brother-in-law asked me to join them. It took me 5 minutes to decide! While working at the shop my passion for realism in miniature grew. I noticed that factory made window treatments and bedding were manufactured with cost in mind. Some poorly pleated big prints on small beds were fine for four year olds, but what about the adult collectors? The fast assembly of glued quick-stitched fabrics began to frustrate me. So, I decided it was time to grab hold of some patience and produce realistic, quality, window treatments and bedding. My quest began by experimenting with fabrics. Sewing, hemming, seaming as if they were real draperies and beds was fun and brought beautiful results! My mother was a seamstress, so fooling around with a sewing machine came naturally. 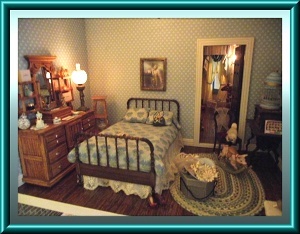 The same techniques moved on to dressing dollhouse beds. The beds were beautiful made up, but what if they looked lived in! 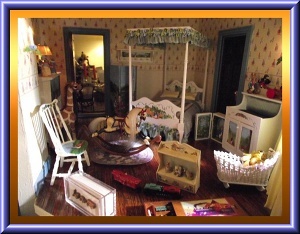 If someone owned beautiful old dollhouse furniture they couldn't let go of, I would repair, reupholster and give it new life. It would take me twelve to fifteen hours to finish a window treatment or bed but it was worth it! 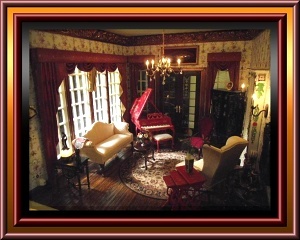 My cornices are handmade of wood - then in some cases - are upholstered in fabrics. My pleating is done by hand. I found that a pleater produces unnaturally uniform pleats. I use the finest silks and cottons. The comforters on the beds are very detailed - each lined in contrasting colors. So here I am: ready to spread wings on my own. I design beautiful things for those of discerning taste. Call me crazy, but when I sit back and view the result, I am a happy man! My Name is Wilson Santiago and I am a satisfied artisan in miniature!